Welcome to Tarleton Tip Thursday, where every week we help you rock your social media skills. Consider all of the pokes, likes, comments, and tags that make up years of Facebook activity. What if you could access it? There's a simple way to download all of your Facebook data. Here's how. 1. Log in, and click the arrow to the right of Home. 3. Underneath General Account settings, click on Download a copy of your Facebook data. 4. Read the screen to find out what information will and will not be included. Click on Start My Archive. You can also opt to get an expanded archive. 5. Be patient. Depending on how long you've been on Facebook, it may take a while to receive all of your data. When your archive is ready, you'll receive an e-mail so that you can download it. 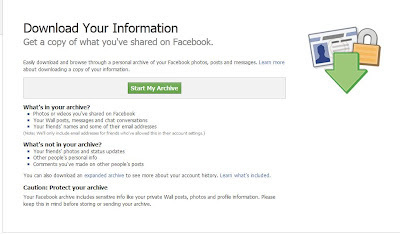 Depending on how long you've been on Facebook, the archive could be quite large. It may also contain sensitive information, so be careful whom you share it with. Why download your Facebook data? As you're probably aware, Facebook has been caught in a number of privacy controversies over the years. 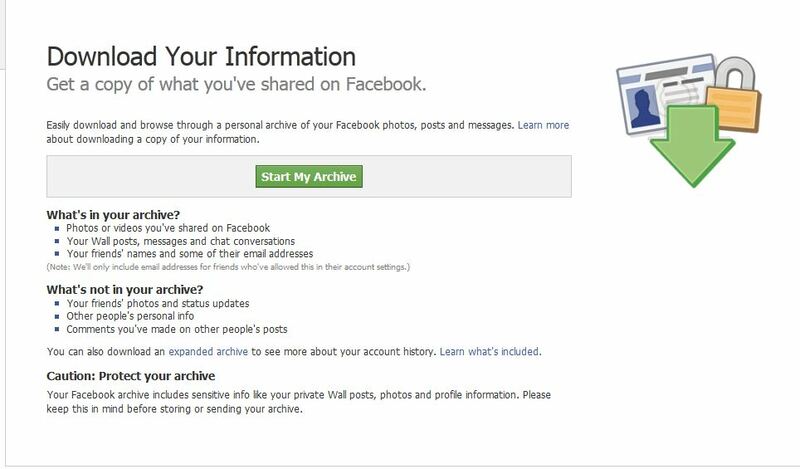 Downloading your data (especially the expanded archive) can help give you an idea of just how much of your information Facebook has aggregated over time. However, this may not be the complete picture. Miranda Miller of Search Engine Watch brings up a very good point: What about the data that Facebook has collected without your knowledge? Her discussion includes interesting points about Facebook and privacy in Europe, as well as how even deleted Facebook posts can be accessed in courts of law. Be sure to check out her post. Questions? Comments? Hit us up in the comments box below! If you're interested in writing for this blog about any of the topics mentioned above , please contact us on Facebook or Twitter. Submit a proposal for the Journal of Social Media in Society.